Unlocking The Mysteries Of GRAVITY FALLS | Warped Factor - Words in the Key of Geek. There are some spoilers for season one included below. 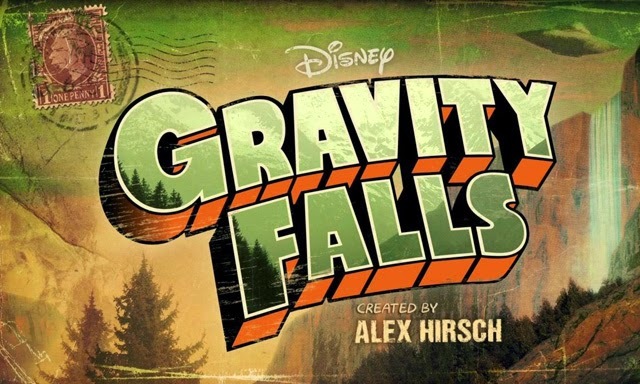 Gravity Falls is a Disney XD animated show that follows the adventures of 12-year-old twins Dipper and Mabel Pines in a town called Gravity Falls, Oregon while they're on summer vacation. At the start of the series Dipper (voiced by Jason Ritter) and Mabel (Kirsten Schaal) are sent to spend the summer with their great-uncle (or "Grunkle") Stan, who owns The Mystery Shack, a tourist trap. Gravity Falls is a town surrounded by mystery and full of unexpected situations that involve paranormal and supernatural creatures, and the twins dive head first into all of them. As the twins attempt to adapt to their new surroundings they sense something strange is happening in the town and begin to unlock its secrets. When Dipper discovers a cryptic journal that offers insight into the town's mysteries, he and Mabel use it and their enthusiastic desire to solve the imminent mysteries that surround them. With the help of Wendy, Dipper's crush; Soos, friend of Dipper and Mabel and handyman to Grunkle Stan; plus an assortment of other characters, Dipper and Mabel always have an interesting day ahead of them. Technically, Gravity Falls is a cartoon for kids. But tell that to the millions of adult enthusiasts who scour every episode for clues, spend hours decoding ciphers and cryptograms, and then flock to online forums to discuss all in obsessive detail. I must admit I'm one of these people. Littered throughout the show there are these ciphers and cryptograms that clue the audience into something that will eventually come to light in the later series. In fact, as many fans of the show have found out, the title sequence tells you what cipher you need to use. First you have to reverse the theme song, and that whisper at the start (or the end if you don't reverse it) holds the key. There's a lot of conspiracies concerning Gravity Falls. Some have proclaimed the show a subtle form of Disney advertising their alliance with organisations like the Illuminati, but in reality the show just happens to have a good time giving fans hidden messages to tinker with when the show is over or on hiatus (which annoyingly happens a lot). But with that being said, Disney does have a track record of subliminal messages - for example including mouse shaped clouds in a number of their films as well as the infamous SFX dust cloud in The Lion King. There are many symbols hidden in the seams of Gravity Falls, it would seem Disney continue to revel in subliminal imagery and Easter Eggs. However for Gravity Falls, these Easter Eggs are much more menacing and Intriguing. For those who look closely will notice that even the characters have their own symbol. Dipper is represented by a tree, Mabel is stars, Soos is a question mark and Grunkle Stan is a half moon. In the opening credits, there's a page in the book with their symbols in a circle. This could be hints to their roles in the ultimate plan, maybe? Now in the centre of the circle there's this Triangle Man. Although he appears in every episode in the title sequence, his first appearance is held out until the nineteenth episode of the first season called Dreamscaperers, which is the first of the two-part season finale. 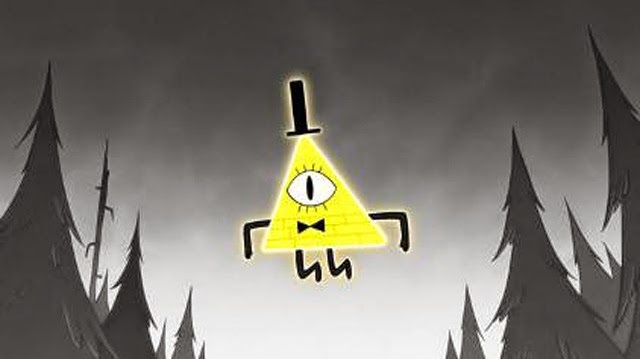 This Triangle Man is Bill Cipher, the omniscient, omnipresent triangular dream demon with unknown motives who's been running amok in Gravity Falls since being summoned by Gideon, one of the Pines Twin's antagonists. In season 2 he's the main antagonist. 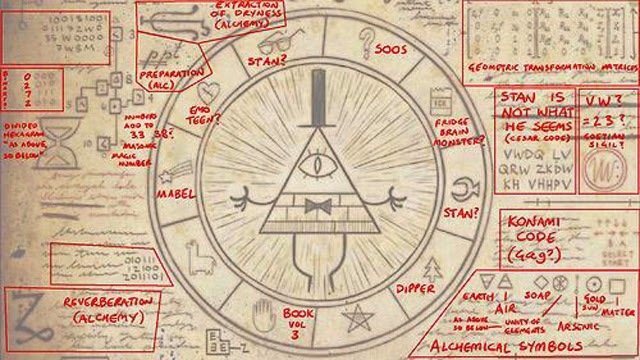 Bill and the symbol he's based on, the Eye of Providence, appear frequently in Gravity Falls. When he appears physically for the first time in Dreamscaperers, he refers to Dipper, Mabel, and Soos as "Pine Tree, Shooting Star, and Question Mark" - the symbols around his picture in the book. He's an eccentric, insane (according to Gideon), possibly psychopathic and physically irreverent demon who finds most things amusing (although no one is really sure why). Though he may come across as simply annoying, he's not to be taken lightly; when angered, he's a force to be reckoned with. So to round this article up, Gravity Falls is a fantastic show for basically all ages, everyone can watch and enjoy it. It's funny, it's creepy at times and you can conspire to your heart's content concerning it. The second half of Season 2 is set to return in the summer, so there's plenty of time to catch up on Dipper and Mabel's weird and wonderful adventures in Gravity Falls. Having grown up in a dungeon it isn't any wonder that Tyrell is a little bit weird, though her mother (Gail) would say she's a big part of the occasionally wonderful too. Knowing her ranking against the world's most demanding cat, Tyrell manages to slip the manacles off to run barefoot through a world worth ranting at.